Our smartphones today are pretty capable devices even when it comes to graphics-intensive tasks such as gaming. Have you played PUBG on a smartphone yet? It’s awesome. But even the most ardent smartphone gamer (if there is something called a smartphone gamer) will have to admit that it’s no match for console or PC gaming. No matter how powerful our smartphones get, PCs and console are getting powerful too. Which means a lot more detail, and much better graphics. There is a solution to this and it is called Cloud gaming which allows you to play PC and console games on Android. I don’t usually enjoy gaming on my smartphone and a part of that is because my PC has games that look much better. I also don’t enjoy touchscreen controls but for the right game, I’m ready to get touchy. Still, I can’t help but notice the graphics difference between the games I play on my PC and the ones I play on my phone. Even PUBG looks so much better or a PC, or a console. But why should all that processing of images and audio files happen on your smartphone anyway? There is no law of physics that makes games run right on your phone. It’s a choice we’ve made and that can also easily be changed. 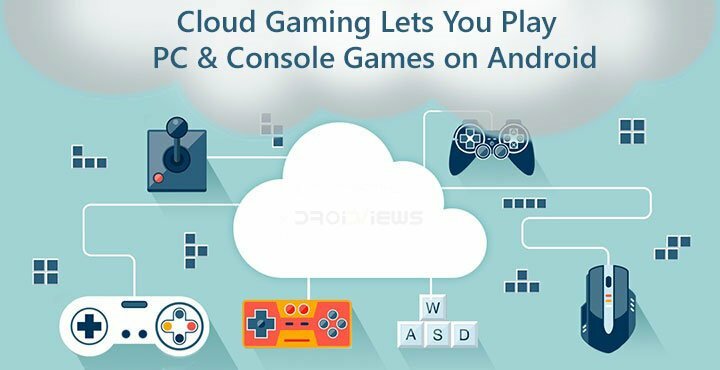 Cloud gaming is very much like cloud storage where instead of being installed on your smartphone, or even your PC or console, the games are installed on a server elsewhere. All the processing happens on the server and you simply get a live video feed on your smartphone. Certainly, streaming video requires fewer resources than gaming. Your inputs, such as aiming and shooting or anything else is sent to this server over the internet. So basically you’re remotely gaming on a server far away. Yes, of course, you will need a fast internet connection to enjoy uninterrupted gaming and in many parts of the world that can be expensive. It can’t be as expensive as buying a powerful gaming PC though. That’s where you save your money. You get to enjoy high-end PC graphics without having to buy one, and on the go at that. If you’re worried about latency issues, you don’t have to, unless you’re a serious gamer who needs wired controls for that microsecond precision. If you’re fine using Bluetooth controllers, you’ll be fine playing on the cloud. There are plenty of companies jumping into the cloud gaming platform, after all, there are some big bucks to be made here. EA, the gaming industry giant, recently acquired GameFly and it’s cloud gaming technology. GameFly did not survive the buyout, and its services have ended. Others have come over to take its place. All you need to do is basically install an app like you would for Netflix. You pay a subscription cost which depends on your location and the app you’re using. This is very much like on-demand video streaming services, except it is for games. Games take up huge amounts of storage space compared to movies or TV shows. This means, as a general rule of thumb, be prepared to shell out more than you do for your Netflix or Amazon Prime subscription. There is a little difference. Movies are cheaper compared to games that can cost up to as much as $120 or more. 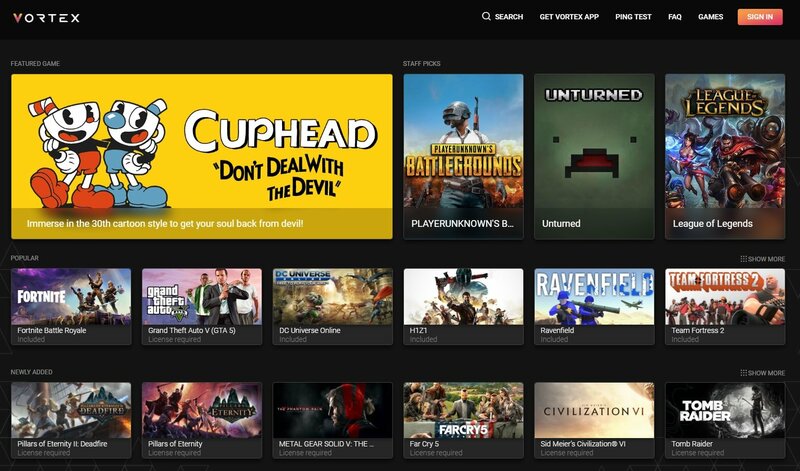 A subscription to these cloud gaming services brings you many games for free. Some popular games such as GTA V will still require that you buy them separately. Here are some services that have Android apps available that you can download. Vortex has a huge library of games that you can play for free, provided you’re a subscriber. There’s no free trial unfortunately but Vortex is quite open about its catalog of games. You can see which games exactly do you get to play and which will require a further license. The library includes popular names like Fortnite, GTA V, Tomb Raider, etc. PUBG is also available to play without having to buy the license. Vortex is available on Android as well as Windows although the Android app is still in beta. Hatch also boasts of a huge collection of games like Vortex but the services are quite different. Vortex offers high-end AAA games, you still have to pay up further for some like Far Cry 5. Hatch gives you a library full of free games, but none of these are very popular games barring a few. Furthermore, most of these games will run on your Android device just fine. The advantage Hatch offers is more like Netflix than Vortex. While you can play most of these games on your Android, installing and buying these many wouldn’t be ideal. With Hatch, you get to play hundreds of game on demand without having to install any or pay for all of them. You only pay a subscription cost. With Hatch, you can even let your friends play instead of you, to help you out with that difficult Angry Birds level. LiquidSky is one of the more popular services on Android in the cloud gaming department. It came onto the scene earlier than Vortex, yet the Android app has remained in Closed Beta phase, exactly where it was last year. Nevertheless, LiquidSky’s library of games is as impressive as Vortex’s, if not more. It boasts of excellent and popular AAA titles such as Fallout 4, Call of Duty, Witcher 3, Rocket League, and many more. You can even link your Steam, Blizzard and Origin account to enjoy your existing library of PC and console games on your phone. LiquidSky has their data centers in San Jose, CA – Dallas, TX – Washington D.C. – Frankfurt, Germany – London, UK, and Hong Kong. If you live close to any of these locations you’ll most likely enjoy much better service than elsewhere. Shadow is a bit different from the rest of the services mentioned above. It says cloud gaming in the title, but Shadow is more accurately a cloud gaming PC. It does not give you a massive library of free or premium games. All it gives you is a PC that you can access from the cloud anywhere. You can, of course, play all the games you already own on it. You’ll still have to install games normally to this cloud PC. The advantage here is that you can do a lot more with it such as running other graphics intensive programs like Adobe Premier. Before you invest in it though do consider the Play Store ratings and comments.